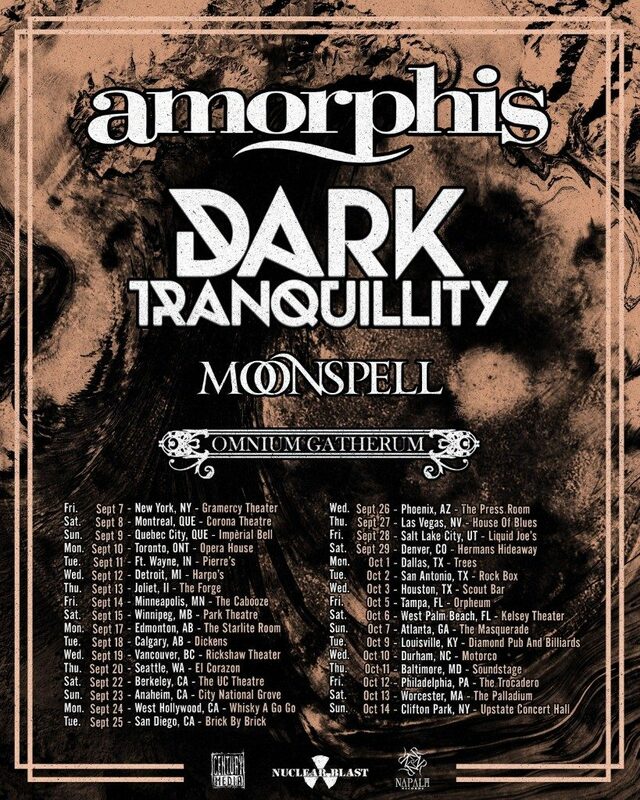 DARK TRANQUILLITY North America tour with Amorphis, Moonspell, and Omnium Gatherum starts Sept 7th. Sweden’s melodic death metal stalwarts DARK TRANQUILLITY finally kick off their North America tour with Finnish heavy metallists Amorphis, gothic metal outfit Moonspell, and CENTURY MEDIA RECORDS labelmates OMNIUM GATHERUM, this Friday, September 7th. Full dates can be found below. DARK TRANQUILLITY will be out in continued support of their eleventh studio album, 2016’s “Atoma”, which was nominated for a Swedish Grammi award and landed at #3 on the Billboard Heatseekers chart & #19 on the US Hard Music chart upon its first week of release. Check out the video for the album’s pulverizing single “Forward Momentum” here: https://www.youtube.com/watch?v=suhuQlYZwtE. ‘Atoma’ can be streamed/downloaded at http://smarturl.it/AtomaiTunes.